Boston Ballet soloist Dusty Button owes much of her success to the fast-paced world of dance competitions. In her early years, she competed in jazz and contemporary, and her first Youth America Grand Prix win landed her a spot at American Ballet Theatre’s Jacqueline Kennedy Onassis School, which led to a contract with ABT Studio Company. Button’s story is one example of how a school’s view on competition can factor into its training philosophy. Students who compete are often virtuosic performers with a commanding stage presence; dancers who don’t compete often excel in technical nuance and refinement of style, but may not have as much stage experience. When choosing a school, consider how its policy on competition fits your personality and whether it will get you to your career goals. Still, The Rock School for Dance Education co-director Stephanie Wolf Spassoff says that dancers who are selected to compete may follow a different rehearsal schedule. “Sometimes while one group is competing, another will be doing a school show,” says Spassoff. Perhaps the biggest difference between students who compete and those who do not is that competing dancers are regularly exposed to the pressures of professional life. Competition forces dancers to take responsibility for the preparation and outcome of their performances, and learn how to deal with nerves. Plus, competing helps build stage presence. And it is a great platform for dancers to be seen by company directors—a potential kick-start to a career. The key is to choose a school that fits your personality, where you are in your training and your career dreams. What do your favorite companies value? Research their dancers’ training paths. The school you choose now will shape the kind of dancer you will become. SAB of the West (With a Twist)? Attend any Boston Ballet performance and you’re almost guaranteed to see one of the Cirios onstage. Although the sibling principals, Lia, 27, and Jeffrey, 22, are rarely paired, they’re two of the company’s most in-demand dancers. Lia, striking and elegant, moves with power and finesse, while Jeffrey, who rose from first-year corps member to principal in just three years, imbues his roles with youthful virtuosity. Both dancers fit easily into Boston Ballet’s diverse repertoire, earning acclaim in works that range from Elo to Balanchine to Petipa. Offstage, they’re the hip kids of Boston’s dance scene, with their home-crafted fashions, quirky tattoos and artsy vibe. Lia recently enrolled in an undergraduate program at Northeastern University; Jeffrey has begun to choreograph in his spare time. They live a few blocks from each other, and often grab lunch or dinner together during the season. Last fall, Pointe followed the Cirios through a day of classes and rehearsals as the company transitioned from La Bayadère to The Nutcracker for its 43-show run. From the moment she gets her first company contract, every corps de ballet dancer dreams of moving up through the ranks. A lucky few are promoted quickly. But more often, corps members must work for many seasons before the title of “soloist” finally comes (if it ever does). While that wait can feel discouraging, it can also be a lesson in patience and tenacity—and in how to find your own artistic opportunities. 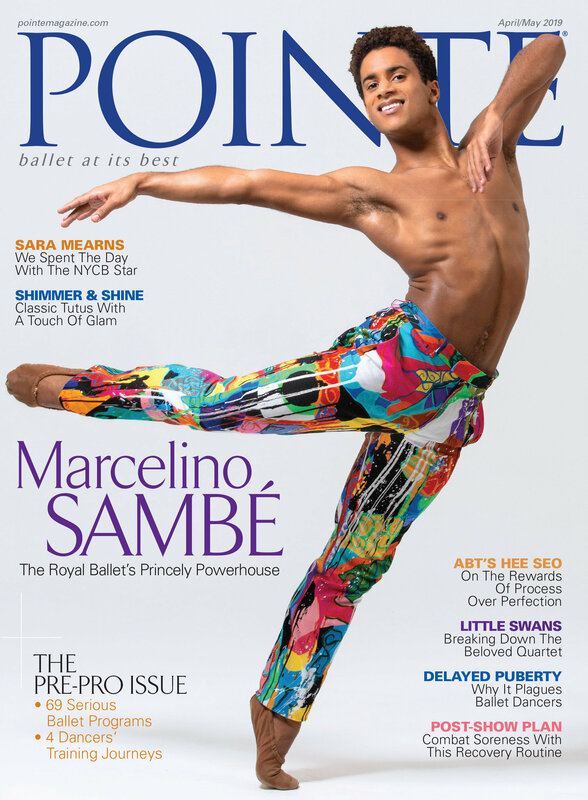 We asked three dancers who spent several years in the corps de ballet to share the breakthrough moments that finally resulted in their promotions, and the lessons that kept them going on their prolonged paths to the spotlight. I was in the corps for 11 years. Some people might have given up on a promotion around year 10. I felt discouraged at times, but I knew I wanted to keep dancing. I had discussions with director Peter Boal about what I needed to work on. He recommended improving my overall strength, so I started exercising outside of class and going to yoga. There was a time when I didn’t think I would ever be promoted, and I had to learn to be okay with that. I was getting solos and variations, so I could find moments onstage that were fulfilling for me. You have to come to a place of peace within yourself—if a promotion isn’t going to happen, dancing professionally is a huge opportunity in itself. In 2008, we had a full-company audition for Ulysses Dove’s Vespers. The stager, Nasha Thomas-Schmitt, saw something in me and chose me as one of the 11 cast members. The movement in the ballet is powerful, almost rough. Until then, I’d been seen as a classical, lyrical dancer. Realizing I could do this different style of movement gave me so much more confidence. And I think after Peter saw me do Vespers, he saw a different, more diverse dancer in me, too. My career has always been a slow process. I’m a very shy person, and I’ve struggled with confidence issues. You can’t change your personality in a year. Opening myself up took some time. If I did have a breakthrough moment, it was in 2010, when I was cast as the Fairy Godmother in Cinderella. It was my first big solo part, and it was a good transition for me. I was comfortable in the role—it was technical, but not too technical. Things picked up from there: A couple months later, I was cast as Effie in La Sylphide, and at the beginning of the next season, I was promoted to soloist. I’m a positive person, but I think we all get discouraged at some point in our careers. I was a late starter, not studying ballet seriously until I went to English National Ballet School at 18. (At that point, I couldn’t even do a double pirouette! I had a lot to catch up on.) I’ve had a few injuries that delayed me as well. You feel like you’re disappointing yourself and your director. But, you know, it’s life, and at some point, you have to get past it and say, I’m going to move forward. I wish I’d understood that sooner in my career. During my second year in the corps, I understudied the role of the Bee in our Nutcracker. It’s a big jumping role, which I love, and I’d always wanted to do it—it felt so “me.” A couple of days before we closed, they decided to put me on. After that, I started getting more demi-soloist work and some solos in full-length ballets. Performing those parts gave me the drive to push myself to improve. I wanted to show that I wasn’t just a corps member capable of doing soloist work—I was actually capable of being a soloist. That was a matter of proving two things: that I was dependable and consistent, and that I had the technique to handle regular soloist casting. I knew I had to polish my port de bras and make sure my feet were clean, in particular. Once I refined those things, my promotion came. I did have days where I thought, Oh, all I really want is to be a soloist. But then I’d ask myself: What’s more important, having the title, or doing the work? I think a lot of young dancers focus too much on the title. Everybody wants to make it to soloist and principal—I mean, that’s why we started dancing. But you can’t control whether they’re going to give you a soloist contract or not. All you can control is yourself. You just keep trucking ahead. What’s your biggest nightmare onstage? You do a lot of tall girl roles, especially in Balanchine. What do you think makes you such a great fit for them? I don’t know, because I’m only 5' 4"! But I feel so comfortable in those roles. People will see me after a show and say, “Oh, I thought you were so much taller!” My feet are big—that might be the reason. I get on a sewing kick every few months. I’ll start sewing legwarmers and skirts and stuff like that. I cut a lot of things up and remake them. I have this thing for anything loose and drapey. I’ve heard you’re a fashionista. What’s your style like outside of the studio? Casual, but I’m also very girly. When we dress up for events, I like to wear hats with nets and feathers. I love 1920s and 1940s fashion—really classy outfits with high waists and cinched belts. I do a lot of shopping on Etsy.com. It’s the devil. Do you have any hobbies with your husband, principal Yury Yanowsky? The other night I killed him at beach volleyball. He loves to play guitar and make me write the lyrics. We play Xbox Kinect together. And we love to travel. We go to Spain to see his family every summer, and we always go somewhere else, just the two of us. If you could have one ballet superpower, what would it be? I’d love to be able to turn without worrying about it. To do, like, quadruple fouettés. That would be fabulous. You’re very active on Twitter. What do you think about the role of social media for dancers? There’s a fourth wall in ballet. It’s considered an elitist art form, and I don’t think it has to be. It’s good for people to see that we’re human. I think that if our audience is interested in us on a personal level, they will be more interested in seeing what we do onstage. Otherwise, they can just stay home and watch it on YouTube. When Boston Ballet resident choreographer Jorma Elo selected Corina Gill to perform alongside three of the company’s best-known dancers—Kathleen Breen Combes, Whitney Jensen and Lia Cirio—in his 2012 premiere Sharper Side of Dark, she did not shy away from the challenge. Within Elo’s dark, intriguingly beautiful universe, Gill created a magnetism all her own. Whether she was bursting into flight or showing off her pristine lines, what you noticed first were her eyes—deep, with an intense soulfulness that drew you in. “It was a big moment for Corina, and she deserved every bit of it,” says company ballet master Tony Randazzo. “It’s a new step for a choreographer to work closely with her on a premiere. It shows that she has the maturity to really thrive in that capacity.” But this isn’t the first time that Gill, a Boston Ballet corps member, has proven her ability. Just three years ago, she was a critics’ sweetheart dancing one Balanchine lead after another at Los Angeles Ballet, before making the bold move to join the corps in Boston in 2009. When Gill was growing up near San Diego, California, her mom would drive her to Black Mountain Dance Centre. There she studied an eclectic mix of ballet styles that included Cecchetti examinations. Early on, she became fascinated by Boston and its ballet company, and in her teens she attended Boston Ballet’s summer intensives. Though Gill was determined to have a ballet career, her father insisted that she attend college, so she studied dance at the University of California, Irvine, with David Allan, director of ballet studies. While in college, she performed with San Diego Ballet. After graduation, she danced with Eliot Feld’s Ballet Tech before returning in 2002 to California to get married. She was 21 and wanted to build a career close to her husband, Cory, who worked for a Los Angeles car rental company. The next few years were difficult. “There were many times when it seemed like a ballet career wasn’t going to work out for me,” she says. First, she joined Ballet Pacifica during a time when the company was frequently changing artistic direction. Two years later, she moved three hours north to join State Street Ballet, which meant frequent long drives back to L.A. to see her husband. Then, in 2006, everything changed. A friend told her about a new Los Angeles company founded by Thordal Christensen and Colleen Neary. She auditioned and was offered a contract. From its first season, Los Angeles Ballet thrived. And Gill quickly won the spotlight, dancing principal roles in the company’s Balanchine repertoire. “To be trusted to do that was incredible,” she says. After the initial rush, she began to doubt herself. “When I first came to Boston, I almost felt like I was starting over, because I got scared all of a sudden,” she says. “I was in my dream company, and I had everything to lose if they ended up being disappointed in me.” Still, she was grateful to finally be dancing full-time and for the opportunity to be the breadwinner while her husband pursued his own dream, attending seminary school in Boston. (The couple are both devout Christians.) Gradually, Gill’s fears receded. GBA has only been around since 2006, but its strong Vaganova training (modeled after the Vaganova and Bolshoi academies’ eight-year program) is unique in the region. Students get lots of one-on-one attention—classes only have 4 to 15 students. Plus, the studio’s close proximity to New York City means that guest teachers such as American Ballet Theatre principal Irina Dvorovenko and NYCB legend Allegra Kent can easily drop in for the day. Fun fact: The Port Chester loft-like studios used to be a Fruit of the Loom factory. Founded in 1949, Alexandra Ballet has made a reputation for itself through Regional Dance America—the school’s pre-professional company recently represented RDA’s Mid-States Regional Ballet Association at the 2010 International Ballet Competition in Jackson, MS. Alexandra Ballet also keeps up a connection with Cincinnati Ballet, whose dancers often give master classes and perform with students. Competitions: The school doesn’t emphasize competitions, but supports students who compete. Fun fact: The school was recently filmed for a British documentary called SwanSong, about Alexandra Ballet alum Ian Archer-Watters (former Les Ballets Grandiva dancer). MBA students benefit from an inside connection to Pennsylvania Ballet: Led by former PAB assistant ballet mistress Lisa Collins Vidnovic, the faculty includes several current and former PAB dancers and artistic staff, including the artistic director of the second company. Fun fact: MBA has a special Boys’ Scholarship Program with more than 60 boys enrolled. Students at this California studio gain connections all over the world—SBA regularly brings in top master teachers, such as Royal Ballet School director Gailene Stock, NYCB principal Megan Fairchild and even Kirov director Yury Fateyev. Fun fact: Southland students are loyal: The school (now almost 30 years old) currently has third-generation students—the grandchildren of some of its original dancers! Fun fact: The school is beginning its 47th year. Westside students have a direct link to George Balanchine himself: Director Yvonne Mounsey was an NYCB principal under the choreographer, so she teaches his style as she learned it firsthand. Fun facts: This past summer, New York’s School of American Ballet held a two-week summer session at Westside Ballet. IBS takes the “international” element of its name seriously, inviting former Bolshoi and Paris Opéra Ballet dancers to teach master classes, and producing stylistically versatile students who go on to dance all over the world—from Monaco to Switzerland to Germany. Fun fact: IBS has recently begun purchasing sets and costumes from companies like London Festival Ballet and Houston Ballet. In a recent Peter Pan production, the school rented rigging so that the dancers could fly onstage! American Harlequin is in the business of providing dancers with a solid foundation—both literally and figuratively. This year, the dance floor company will award between $500 and $5,000 to 10 aspiring dancers selected at random. You must be an American or Canadian citizen, ages 15 to 21, enrolled in a dance school to enter. Fill out an application at harlequinfloors.com. by November 1. The Jacqueline Kennedy Onassis School boasts star teachers, an unbeatable connection to American Ballet Theatre and dozens of high-profile alumni. But the school has never been able to offer a full boarding experience complete with dorms and academics—until now. This fall, JKO took the University of North Carolina School of the Arts School of Dance ballet program under its wing. UNCSA faculty members have become certified in the ABT National Training Curriculum, and ABT staff will visit Winston-Salem annually to give master classes, judge exams and scout for Studio Company prospects. ABT staff will also assist the search for a permanent replacement for Ethan Stiefel, who served as the dean of UNCSA’s School of Dance for the past four years before leaving to become artistic director of the Royal New Zealand Ballet. See uncsa.edu. At competitions, it’s usually every man for himself. But the Youth Dance Festival of New Jersey aims to give dancers a place to perform without sacrificing artistry in service of splashy tricks. Winners are chosen, but everyone receives written feedback, a certificate of achievement and access to workshops taught by jury members. To register: Go to ydfofnj.org. Can you write passionately about your ballet training? You could win Costume Gallery’s annual Beverly Miller Scholarship. Judges will award up to $1,000 to 19 dancers ages 12 to 21. Selections are based on dedication and financial need. The money can be used for anything that furthers your training. Apply by November 1 at costumegallery.net.